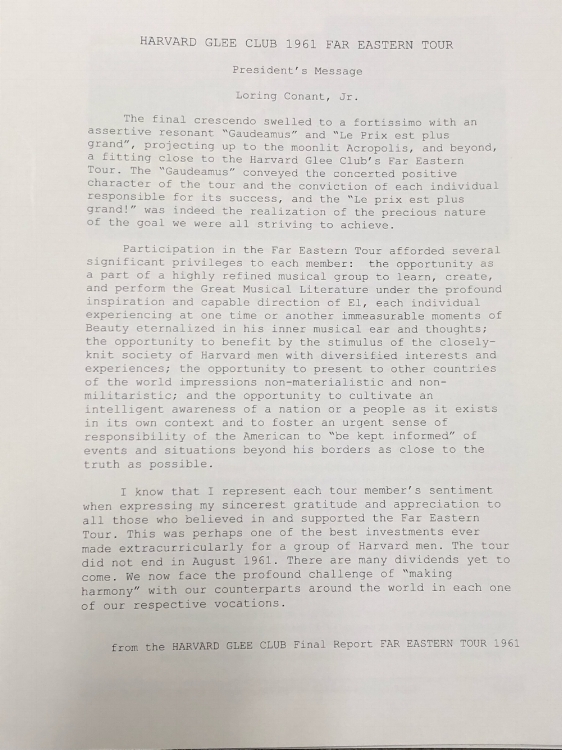 It has been over 55 years since the above few paragraphs were written on behalf of all each of us who had the rich experience of being a member of the Harvard Glee Club 1961 Far Eastern Tour Group. 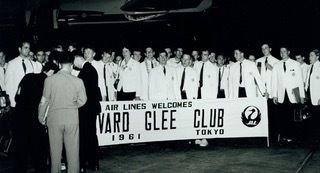 Each one of us surviving members is continually nourished by the many memories of those 9 weeks in the summer of 1961 which took us literally around the world, offering concerts beginning in Los Angeles, heading westward via Hawaii to Japan, Korea, Taiwan, Hong Kong, the Philippines, Thailand, India, ending in Greece. At our last major reunion, the 50th, we recognized the loss of 10 of our members. Over the last 7 years, 2 more, with a increasing number of those of us enduring, carrying significant medical problems. This website will offer an easy way for our being in closer touch with one another through shared reflections, photos, even music. It can be a “perpetual reunion”. Share your comments (and photos if you desire) below about the topics raised in the letter above. You can scroll through all the exchanges below. Write a comment in the text box to share with fellow HGCF members and participate in the exchange. After you have written your comment, enter your name in the “Name” text box that appears below the comment box. Select “I'd rather post as a guest” if you do not wish to sign up for a Disqus blogging account (Note: if you want to add an image to your comment you must sign up for a Disqus account). Finally, enter your email address in the text box below the “Name” text box and accept the Disqus terms and conditions. Click the arrow button in the lower right hand corner to submit your comment. Your comment will appear within 24 hours of your submission if you posted as a guest. If you have a Disqus account, your comments and pictures will appear immediately.